Floating Docks are ideal for deep or fluctuating water conditions. A big advantage of a floating dock system is it stays at a constant height above the water which is ideal if you keep a boat moored to it. The stability of a floating dock increases with it's size. Dock Installation Most installations are at least 6' wide, with 8' or 10' providing a much more enjoyable experience. Floating dock systems typically use a ramp to keep the dock secured to shore as it moves up and down with the water. Concrete anchors and are also used to make the dock as stable as possible. Floating dock systems are able to stay in the water over the winter unless your specific ice conditions make damage likely. Handcrafted Docks: Every Designer Series Floating Dock is hand built from only the highest quality materials. Each system features a welded marine grade aluminum frame, western red cedar decking, and industry leading foam filled plastic PermaFloats. Stainless steel fasteners mean your system will last a lifetime without rusting. 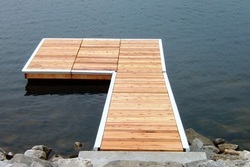 Designer Series Floating Docks come in a wide variety of sizes and custom designs allow for maximum flexibility. Delivery & Installation services are also available. The new Leisure Series Pole Dock is the most innovative leg dock in production today. It's precision made and light weight design bolts together instead of welding. This type of construction technique makes it a great package for a summer Do-It-Yourself project. Made from T-6 6061 grade aluminum its truss style webbed frame design assures an excellent weight to strength ratio. Only non-corrosive aluminum and stainless steel fasteners are in the docks assembly. Wooden docks have been built for centuries and survive today in the Classic Series Wooden Dock. Traditional construction techniques matched with extruded aluminum structural hardware creates a system that will blend with the beauty of your shoreline for years to come. The Micro Pro Sienna Treated Docks are hand crafted in Muskoka using quality Canadian materials. Very reliable foam filled plastic PermaFloat dock floats come in a full range of sizes to allow for the right float to fit your design.